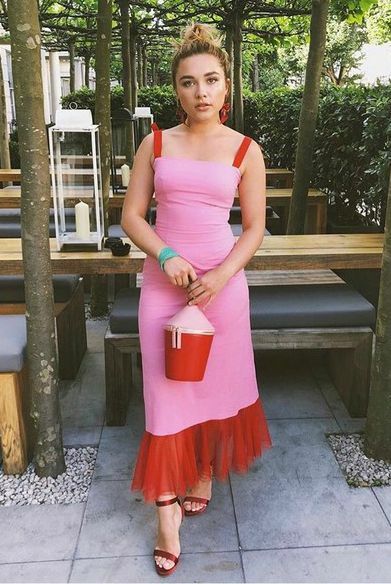 Florence Pugh is an English actress who became known for her starring role as Katherine Lester in the British drama film Lady Macbeth, for which she won the British Independent Film Award for Best Actress, among other awards and nominations. She played Elizabeth de Burgh in the Netflix historical film Outlaw King in 2018. Her other acting credits include The Commuter, The Falling, King Lear, and The Little Drummer Girl. Florence Pugh was born on January 3, 1996, in Oxford, Oxfordshire, England, UK. Florence attended various schools for her formal school education, including the Cokethorpe Junior School, Wychwood School in Oxford from 2007 to 2009 and St. Edward’s School in Oxford. Florence Pugh is the daughter of Clinton Pugh, is a restaurateur in Oxford and Deborah, a dancer and dance teacher. She has three siblings, her older brother Toby Sebastian, an actor and musician, and sisters Arabella Gibbins and Rafaela Pugh, both of them are actors. Florence Pugh has kept her private life away from the spotlight and thus there is not much information available of any relationship she has had in the past or in the present. Florence Pugh got her start in the creative industry in the mystery drama film The Falling in 2014, in which she played the role of a precocious teenager opposite Maisie Williams. She was still in school when the film released. Her performance in the film was described as “remarkable” and “teen-queen bearing with the vulnerability of one still unsure of her own body” by critics. Florence made her television debut in 2016 when she landed a role of Cara Thomas in the ITV detective series Marcella. she appeared in three episodes of the series. Aside from being a successful actor, she is also a singer. She released her debut single titled Wooden Pages in 2009. In 2015, she was cast in the independent British drama film Lady Macbeth, which was directed by William Oldroyd. The film was based on the short story Lady Macbeth of the Mtsensk District by Nikolai Leskov, in which she played a role of a young girl Katherine Lester who happens to marry a bitter man twice her age. The film was a huge commercial success grossing around $4 million and won several awards. Her performance was highly praised by critics, describing “a major talent to watch”, and she won a handful of awards including Dublin Film Critics’ Circle Award for Best Actress and British Independent Film Award for Best Actress, among others. Unfortunately, we do not know much about her favorite things. Pugh’s net worth is estimated around $500 – $700 by the media. She lives in Oxford, Oxfordshire, England, UK. She spent a part of her childhood Andalusia, Spain. As an aspiring singer and songwriter, Florence had first uploaded covers of popular songs to her self-titled YouTube channel in 2013. In 2015, she appeared in the TV movie Studio City alongside Heather Graham and Riley Smith. In 2018, she received a nomination for BAFTA EE Rising Star Award. In 2018, she appeared in a six-part miniseries adaptation of John le Carré’s spy novel, The Little Drummer Girl.